KGBV SOs,CRTs Results/Selection List 2018| Kasturba Special Officers, Contract Resource Teachers Recruitment Merit List 2018 . TS KGBV SOs Recruitment 2018, TS KGBV SOs, CRTs Selection List, Results 2018, TS KGBV SOs Merit List, TS URS SOs, CRTs Selection List, Results. KGBV Special Officers(SOs), Contract Resource Teachers (CRTs) Recruitment 2018-KGBV Special Officers, Contract Resource Teachers Hall Tickets, Results/Selection List 2018, KGBV Contract Resource Teachers , Contract Resource Teachers Recruitment Notification 2018 - TSSA KGBV Special Officer Posts results . 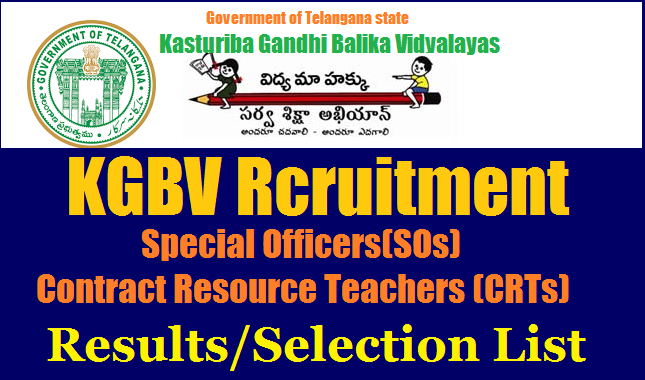 KGBV Special Officers Recruitment Notification from SSA Telangana Special Recruitment Notification 2018, KGBV Schools of Telangana State , Download hall Ticket for Special Officers in Telangana. The State Project Director, Sarva Shiksha Abhiyan, Telangana, Hyderabad notification has been issued for the recruitment of SOs/Special Officers in Kasthurba Gandhi Balika Vidyalaya Schools of Telangana .Last Date to apply, Procedings, Notification and Vacancies details with Reservation, Application Form, General Guidelines for Special Officers Recruitment exam date, hall tickets, syllabus for written test, results are given here. The State Project Director, SSA, Telangana, Hyderabad has decided to fill up the existing vacant posts of Special Officers in KGBVs on contract basis. Applications are invited to work as Special Officers in the Kasturba Gandhi Balika Vidyalayas located in all Districts (except Hyderabad). which are Residential Schools for girls in classes 6-10, on contractual basis for one year. from eligible female candidates who hold Post Graduate Degree and B.Ed. Teaching Experience is preferred. 1. Female Candidates having Post Graduate Degree with 55% marks from a recognized University . 2. B.Ed. Degree with at least 55% marks aggregate. Age Limit:Candidate should have completed 25 years of age and not have completed 39 years of ages as on 01.07.2016. In case of SC, ST, BC candidates, the maximum age limit shall be 44 years and in respect of Physically Challenged candidates the maximum age limit shall be 49 years. Candidates should present the following certificates in original for verification when called for. • Age: Proof of age as recorded in SSC Certificate or equivalent. • Degree Certificates for Graduation and B.Ed. • Permanent Community Certificate/Original Caste Certificate. • Residence Certificate (issued by the Tahsildar). • One Passport photo in addition to the one affixed to the application. The Written test shall be of 2 1/2 hours duration and will consist of both Objective and Essay type Question. The test will be bilingual (English & Telugu).